So here we are and here we go again. It’s December. Yay. Which means we’re in the countdown to Christmas and New Year – double yay! 2017 has been like a musical drive-by that has had me holding you hostage on many a dance floor and you’ll be pleased to know that December continues in this tradition. 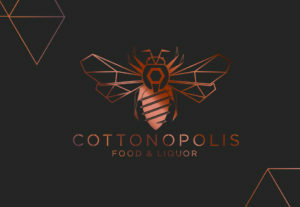 December 1st – I’ll be spending the evening of World Aids Day helping you to paint the town red from behind the decks of Cottonopolis. It’s a rare groove, old soul, funky eclectic, electric boogie kind of thing and I’ll be buzzed to see you there. 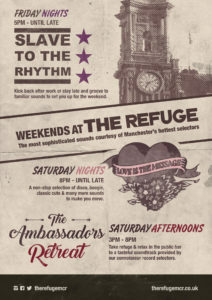 On the decks from 8pm – 2am. I’ll be holding court on the corner of the block on December 2nd from 8pm till 2am and there for a private party on December 7th. Expect disco, boogie, soul and rare grooves with the occasional twist of house. 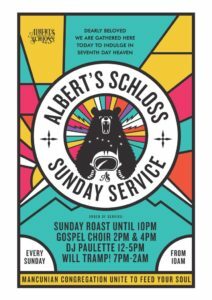 THE ALBERT’S SCHLOSS SUNDAY SERVICE continues throughout December and into the New Year. We’ll be lifting spirits and raising the roof with my delicious selection of soul, rare grooves, r n b and disco, AMC Gospel Choir’s uplifting gospel and contemporary covers and The Manchester Choir’s pop and show tunes – all topped off with the always doubly awesome Will Tramp tearing it up in amongst you and on stage. Not forgetting our house Jazz band, the devilishly good Kronuts and Cruffins, our fresh Winter menu and roasts that will fill even the largest of gaps. Book early and book a table to avoid the wait – this session is always busy. Note to self – Saturdays fortnightly mean it’s time for a raucous Pen and Pencil session. It’s a house party vibe with block party running through it like a stick of rock, so come and enjoy the kind of r n b, hip hop, disco, funk and boogie bangers that will mash your feet up. I’m here from 8pm – 2am on Saturday 9th and the 23rd of December. 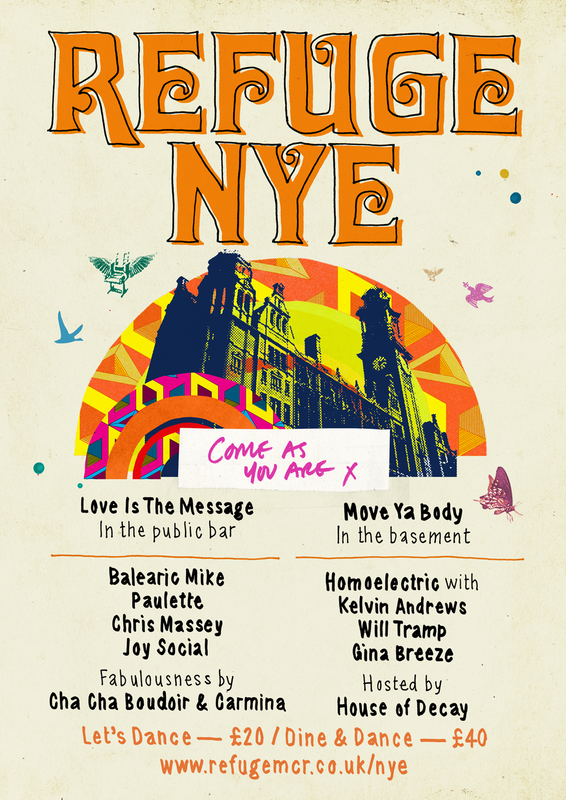 I’m camping out at The Refuge this month, taking care of your post shopping stress disorders with a soothing blend of disco and soul on the 19th and 20th of December. Then I will be spinning a more eclectic and balearic selection at ‘Slave To The Rhythm’ for my birthday present to me on Friday December 22nd. 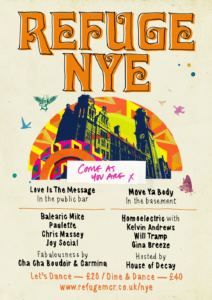 As if that wasn’t enough, New Year’s Eve (Sunday December 31st) is all about The Refuge. The ‘Come As You Are’ team is in full attendance, taking over the Public Bar and the Basement for the night. House of Decay and Cha Cha Boudoir are bringing the glamour – Homoelectric (Will Tramp, Gina Breeze and Kelvin Andrews) are taking care of the underground after hours, whilst me, Balearic Mike and Chris Massey will be whooping it up in the bar. Tickets are £20 on £40 with a full New Year’s dinner. Head to Skiddle for tickets. Entry is free to all bar dates EXCEPT NEW YEAR’S EVE – remember it’s Christmas so if you don’t want to wait outside or be disappointed, booking in advance and arriving early is strongly advised.